Onkyo: keeping the features race and sound quality in harmony | What Hi-Fi? It's almost exactly five years since I visited Onkyo in Osaka: reporting from that trip back in May 2007, I said the company seemed to be 'an outfit with the established leaders of the European home cinema market – notably Denon and Yamaha – firmly in its sights. In the half-decade since, the company has more than made good on that intention, with four straight years as the best-selling home cinema brand in the UK and – as we reported back in February – not just a still-rising market share, but unit sales bucking the trend of a turbulent economy. Last year it increased market share from 30.9% to 34.5%, while its sales rose 5% in a product sector down 12% overall. As well as that market-leadership here in the UK, it's the best-selling AV receiver brand in France, and in second place in both Germany and Japan, while one of the aims of its recent tie-up with guitar-maker Gibson is to use that company's US marketing expertise to pull it up from its current fourth place Stateside. So you might expect the Onkyo engineers and marketing people at the Osaka HQ could afford to relax their foot on the accelerator pedal a little, take it easy and reap the rewards of their success. Well yes, they could, but there's no sign of any such relaxation going on, as I found out last week during a brief return to Onkyo HQ in Japan. Instead, the company is determined to keep on growing its market share with a range of new models addressing as many sectors of the market as it can, offering a choice of facilities and price points. It's also using its strategic alliances – not just with Gibson, but with TEAC, Intel, Dolby and others – to produce innovative products, hopefully with enough of an edge to make them stand out in a highly competitive market. Already announced for this year are models up to the £1000 TX-NR818 (above), including the replacement for last year's Award-winning TX-NR609, and those products are either in the shops now or due on sale in the next few weeks. More receivers are on the way over the next few months, and while the exact details are under embargo, it's not hard to work out that – with the lower and middle sectors of the market covered with the models announced so far, and the press release for the TX-NR717/818 describing them as 'midrange' – even more upmarket designs are on the way. So it is that, almost directly off the plane from London, we are driven to the building still housing the company's speaker development and listening facilities. I say 'still' because last time I visited Onkyo this was the site of the company's HQ, north-east of central Osaka at Neyagawa: the site of the office building is now sold, with excavators digging the foundations for a new, earthquake-proof hospital, and headquarters is now in a relatively anonymous-looking office block above a bank in Osaka's financial district, Kitahama. Last time we were here, for the launch of the -05 series products, we had a full projection home cinema system: this time we're in a larger room, in the corners of which are some huge vintage speakers. Laid out before us is a Sony TV, a TX-NR818 receiver and a Monitor Audio speaker rig, and after a swift blast of lights-out home cinema, courtesy of the omnipresent train crash from Super 8 and a clip of Lady Gaga (left) climbing all over a piano in her undies from her Monster Ball Tour - Madison Square Garden Blu-ray, we get set for some audio-only music listening. Before that, some highlights of the design of the TX-NR818 from Senior Engineer Norimasa Kitagawa, who explains that – while the amp is based on last year's platform – there have been some sound-influencing changes alongside extra features such as the adoption of the HDMI Mobile High-Definition Link for portable devices, 4K upscaling and InstaPrevue picture-in-picture for monitoring multiple HDMI sources. 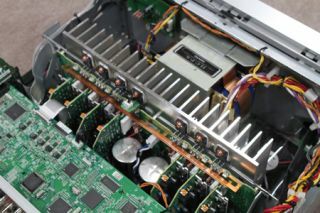 For example, the main power transformer is mounted on the front-panel, not the main chassis, and 'floats' to reduce vibration effects, while there's improved bracing for the main heatsink. The preamplifier and power amp sections are kept separate, each channel has its own amplifier module, and there is fan-cooling built-in to keep the amp on an even keel when working hard. For our listening, the content is sourced from a laptop, acting as a server, and is mainly in Dolby TrueHD, which format Onkyo is now making available for download via its Japanese e-Onkyo music portal, with plans for a global roll-out later in the year. And Taku Kurosawa, in charge of digital music services for the Onkyo Entertainment Technology Corporation – the division running e-Onkyo – is on hand to give us a taste of what the service may offer. Along with some classical content and jazz content from smaller independent Japanese labels, we're treated to a track from the Trondheim Soloists on Norway's 2L label, and one from Antonio Forcione and Sabina Sciubba's Meet Me in London remaster on the Naim Label. And taking into account a) the unfamiliar room, b) the unfamiliar system, c) the unfamiliar format (at least for pure audio) and most of all d) serious jet-lag, I have to say the results were very impressive indeed. The amp seemed to be keeping a pretty firm grip on the speakers, even though they were working fairly hard to fill the large room with music at 'keep the journalists awake' levels, and there was both a real kick and swing to the music and high levels of detail and ambience without any of that old AV amp top-end brittleness. Kurosawa makes the point we'll hear echoed the following day by Onkyo vice-president Hiroshi Nakano – the company has a real ambition to make this service available globally, but is in the hands of the music industry and its labyrinthine licensing arrangements. It's for that reason it's concentrating at first on smaller specialist labels, which will mean mainly jazz and classical titles, because the copyright situation is simpler, as Onkyo Marketing Manager Marty Kashiwai explains. Kurosawa explains that the company is in negotiation with major labels such as Universal Japan, Victor, Sony Music and Warner Music for its Japanese online service, and that at least one of those labels has a list of 400 titles at 96kHz or 192kHz available. And while Kashiwai says Onkyo hopes to go global with some titles, Kurosawa adds 'But it's not up to us; it's for the labels to decide'. He also explains a little of the background of e-Onkyo, which the company has been offering in Japan for seven years, not least because on the domestic market it has long offered a range of 'music computers' designed as much for entertainment storage and playback as surfing and e-mailing. 'We launched in 2005,' he says, 'but Apple's iTunes was three days ahead of us. They had millions of tracks; we had eleven.' So, to set e-Onkyo apart, the company has concentrated on sound quality rather than sheer quantity, which is why it now offers 96kHz and 192kHz content, SACD-quality DSD downloads, and now Dolby TrueHD surround music. Right now it's up to 50,000 tracks in CD quality, and 15,000 at higher resolutions. So, we move on to the forthcoming stereo amplifiers, to be launched in August: they are essentially the same model, but the more expensive of the two has digital inputs in addition to the analogue shared by both. The amplifiers use a variety of Onkyo technologies including the company's Dynamic Intermodulation Reduction Circuitry, which is part of its strategy on the control of signal to noise ratios: it pursues dynamic S/N, or in other words the best performance when playing music, not just keeping the amplifier as electrically quiet as possible when measured without any signal passing through it. That's also the thinking behind the company's use of a three-stage inverted Darlington circuit for its main amplification: as with all these technologies, it has been used in previous high-end Onkyo products, but is now trickling down the range. The engineers say they've been studying 'the European sound' for these new stereo amps, and demonstrate the point by letting us hear the less expensive of the two models fed by a Naim CD player, again driving the Monitor Audio speakers. They admit some more final tuning is required, but the product we hear shows definite promise, even though I'm less than convinced by the Phase Matching Bass technology used to give a loudness boost at low listening levels. It does what they say – ie keeps out of the way of the midband, unlike most loudness circuits, which tend to thicken up all of the sound – but the bass it delivers is a bit overblown and leaden to these ears, and the amp sounds much better with the facility defeated. Day two starts with a brief history lesson, courtesy of the irrepressible Mickey Murata, whose business card describes him as Excutive Producer/Councilor, Product Planning Department. Here we learn that the mother of Onkyo founder Takeshi Godai was the same Mrs Godai in whose Osaka bicycle shop the young Konosuke Matsushita (seen left with Mrs Godai) was employed before going on to found the company now known as Panasonic. It was while working for Matsushita that Godai decided in 1946 to start his own business, Osaka Denki Onkyo. Since then the company has grown, in 1985 launching the first CD player to use optical connections within to improve sound quality by isolating noise, and in 1987 introducing its first Dolby Surround receiver. That's 'its', not 'the' – rather as with e-Onkyo and iTunes, Onkyo was beaten to the Dolby Surround finishing line by Pioneer, which rolled out its first model two weeks earlier. That setback doesn't seem to have done the company too much harm: as of August last year it had sold 6.7m AV receivers. It's also a major manufacturer of speakers in Japan, where it has a market-leading 28.3% of retail share and also OEMs drive units for other manufacturers. We're shown some super-slim drivers designed for use in flatscreen TVs, among them the models made by that rather larger company down the road in Osaka. VP and COO Hiroshi Nakano (right) then outlines some of the current situation for Onkyo, talking about its tie-ups with Gibson and TEAC. He says there are no plans for now for any Gibson-branded Onkyo products, but that Gibson is mainly helping Onkyo boost its marketing profile in the USA. However, he doesn't rule out that there may at some time be Gibson/Onkyo products in the music-creation sector, for example perhaps guitar amplifiers. Regarding TEAC, Onkyo Europe will be taking over the marketing and distribution of the company's consumer products this summer, and Nakano says it hopes to make more of TEAC's high-end Esoteric brand in Europe 'and especially in the UK'. Sounds interesting: seen above, for example, is Esoteric's RZ-1, which is an all-in-one SACD/CD player, amp, 32-bit DAC and phonostage. However, Esoteric aside, he sees there could come a point where TEAC serves as the company's low-end brand, with Onkyo positioned higher. Although Onkyo has a reputation for computers – and especially entertainment-based models – in Japan, and also makes tablet devices (or slate devices as they are called there), Nakano says that the consumer tablet market in Japan is 'a terrible story', which is why he is happy to stick to the business to business sector for these products. Similarly, after previously targeting the US market with its computers, aimed at the custom installation sector, he says he's now content to let people run their DLNA on other company's computers, and provide the means for playback in the form of Onkyo receivers – 'after all, the market is moving to the cloud,' he says. Interestingly, later in the day, when discussing the future shape of the Onkyo stereo line-up, Marty Kashiwai makes the point that in the stereo market people seem more keen to have matching players and amps than they do in home cinema. That's why the company wlll have no fewer than five CD players continuing through this year: 'For us, it's more important to keep CD players [in the range] than Blu-ray players,' he says, adding that one of the main reasons for this is that CD players are more profitable for the company. For similar reasons, it's also planning a move into the headphone business – as Kashiwai jokes, 'We might just be the last brand to introduce headphones'. A variety of models are coming, all of a modular design with detachable cables enabling them to operate with a variety of portable devices and smartphones simply by changing cables – we should start to see them next year. Talking of the future, Onkyo showed us some fascinating concepts indicating the way its engineers are thinking about the future of entertainment at home, and they're mainly related to music playback rather than home cinema.